Komodo Island is located about 3-hour away from Labuan Bajo, West Manggarai by boat. 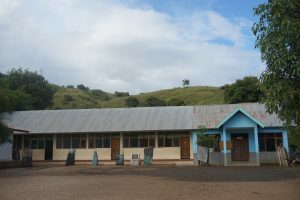 Komodo National Park is one among many national parks inhabited by human. Besides komodo dragons, human do live in this island. They come from various ethnics, including Bajo, Bugis, and Java. 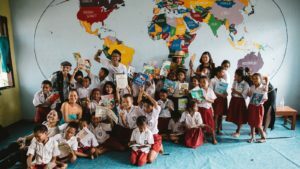 In this island is situated a Primary School and Rainbow Reading Gardens is currently focusing on developing a child-friendly library to be present among the children of SDN Pulau Komodo. 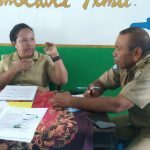 On the first day in Komodo, I attended a meeting with the principal and teachers to discuss the plan to develop SDN Pulau Komodo library. 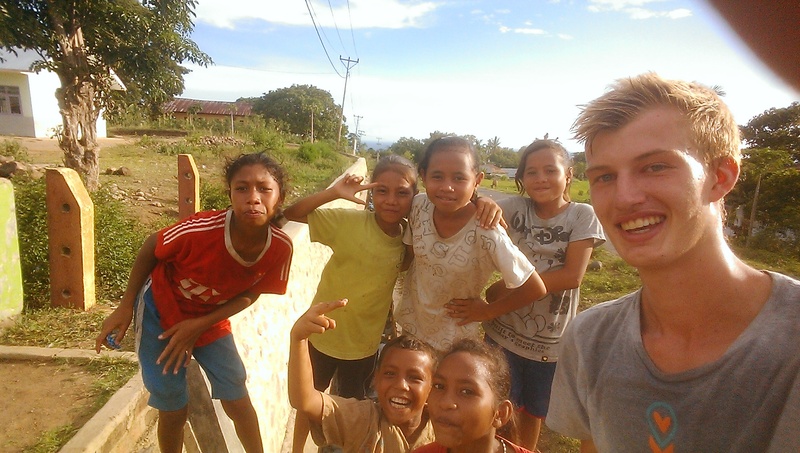 They were enthusiastic for this program, to develop the existing library at SDN Pulau Komodo. In the first week, we conducted a Library Management and Library Period workshop for the teachers as well as the principal. It was a three-day workshop, lasting from Thursday to Saturday. On the first day of the workshop, the participants learned about the features of child-friendly library as well as a habit of reading. Before the session, everyone got involved in an ice-breaking, called “Dancing Marina”. Participants were excited to follow the discussion on the habit of reading. This particular topic is essential as the principal and teachers are expected to implement their understanding on the habit of reading after the workshop. In short, a habit of reading is when children read willingly, often, and they enjoy reading both at school and at home. During the workshop, facilitators led another ice breaking to regain participants’ focus and concentration. The instruction was to make a line based on their height order. The tallest should stand in front, while the shortest at the back. The challenge is, they should not make any sound during the game. 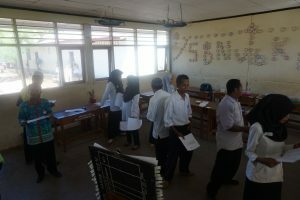 It was very fun, and the participants understood what the game was about: communication and collaboration are essential factors in the advancement of education in SDN Pulau Komodo. The first day of the workshop was wrapped by a review of all the topics discussed on that day. When given questions, participants excitedly raised their hands to answer. Participants were seen forming long lines. They jumped forward, backward, to the left and right. Facilitators opened the second day of the workshop with a game called “jump lie” and participants were all smiles during the game. 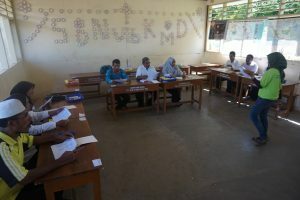 On this second day, participants were learning the 4 reading activities, namely reading aloud, reading together, paired reading, and independent reading. These reading activities are very helpful to stimulate students’ habit of reading as teachers conduct these activities with attractive expression and voice; thus, children are interested in reading more. Facilitators and participants had some discussion on the benefit of reading activities for students. 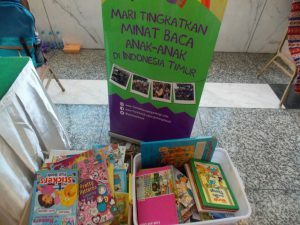 They agreed that this is a breakthrough method to attract children in developing their habit of reading. On the last day of the workshop, facilitators gave a review on the discussed topics. Later on, participants were invited to detect the differences between paired reading and independent reading. On that last day, a teacher also read a book aloud in front of Grade 4 students. The Library Management and Library was summarized by making plans and discussing school-based tasks to develop SDN Pulau Komodo library. Facilitators and participants were also taking a group photo.